Hear the world of Azeroth like never before! Experience the sounds of Azeroth and beyond like never before with the Sound Blaster® World of Warcraft® Headset. Designed specifically for World of Warcraft gamers, the headset features cutting-edge audio technology and THX® TruStudio PC, offering you a truly unforgettable gaming experience. Communicate with your party or raid clearly. The Sound Blaster World of Warcraft Headset features a professional grade microphone, ensuring everyone can hear your shout of “Heal Me! Heal Me!” in all of its resonant glory. You can even declare your staunch allegiance with the interchangeable headset lenses bearing the marks of your chosen faction and 16 million programmable color illumination options. Get ready to be blown away by the amazing realism from unrivaled headphone surround and gaming sound enhancement technologies. Creative really know how to put a headset together the Warcraft headset is awesome to look at and will definitely satisfy any wow players needs. From the funny but gimmicky voice changer to the 16 million programmable colours this really looks the business. 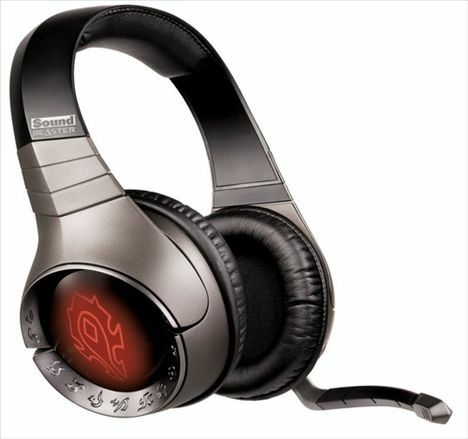 The sound quality is great and sits well around your ears so will last for prolonged wipe… wait.. raiding sessions :). MORE DOTS? no problem! * THX TruStudio PC technologies – THX TruStudio PC sound technologies create unprecedented levels of audio realism and includes stunning surround effects, producing virtual speakers around, above, and below you. * Interchangeable headset lenses – For the Horde! Glory to the Alliance! Show your allegiance and customize with interchangeable headset lenses. Additional lenses coming soon! * High-definition digital USB audio – Hear every battle cry and clash of weapons in amazing detail. The USB connectivity gives you pristine high-definition digital audio whether you are raiding or out on a quest. * Built-in headset controls – Control your audio even while AFK. Instantly access volume, mute and connection controls directly on the headset. * Oversized padded ear cups – Settle in for that epic raid. The headset comes with oversized ear cups with soft leatherette padding, for amazing comfort even during those marathon instance clearing sessions. * VoiceFX technology – Roleplay or have some laughs on your next raid by morphing your voice into different World of Warcraft characters and creatures with VoiceFX technology. * Detachable microphone – Be sure to always get the message across. The detachable noise-canceling microphone gives you clear, precise speech delivery, ensuring your fellow players will hear every word. * World of Warcraft Audio Control Panel – Configure settings easily with custom software that enables you to personalize the illumination of your headset as well as customize your audio experience. Where can I buy the World of Warcraft Headset?